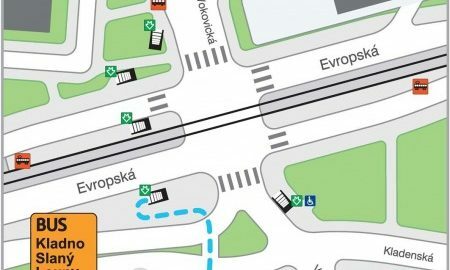 Because of the installation of the escalators, the entrance to and exit from metro station A – Nádraží Veleslavín in the direction of the boarding bus stops in the turning loop are closed from Wednesday the 1st November 2017 (from the commencement of daytime operation) for a period of cca. 5 months (estimated April 2018). The boarding stop for lines Nos. 119 and 225 has been transferred to the former bus turning loop on Vokovická Street. The boarding stop for the interurban lines (Slaný, Louny) has been relocated to the back part of the turning loop (see the attached diagram). On the first day of the applicability of the restrictions, from 7.00 a.m. till 7.00 p.m., passengers can also make use of the information service officers in reflective vests who will be ready to advise on site not only in Czech but also in English. Information concerning the relocated bus stops, is also provided on the information boards of the navigation system, both in the underpass of the station and at the street level.